Here we go again!!! The Fed is lending unsecured to the ECB to keep libor rates from skyrocketing over there. Where is the outrage??? Where are all the "taxpayer on the hook" morons who scream bloody murder in this country??? There goes my euro short! We are bailing out Europe and there is not a peep said about it here in the U.S. Our citizens suffer, but any amount of money for Europeans is okay. They have their own central bank, so why are we doing it??? In my previous post I pointed out that the national debt has risen 13-fold in the past 30 years and interest rates have gone from 20 percent to zero. Yet despite this unequivocal proof that there is no connection between the so-called "debt" and rates, all of mainstream economics and the media continue to warn that spiralling debt will cause rates to spike. ...the Fed does something dumb, like raise rates on the belief that rising debt will create a need to "attract capital." So when the idiots at Moody's S&P and Fitch downgrade America's credit rating (and believe me, they will!) the Fed's reaction to this could easily be to raise rates on the belief that they need to do that to attract capital. This would set in motion a rate increase cycle of who-knows-how-high proportions. Not a pretty sight. In contrast, a Fed that understood its role as rate setter, would counter the rating Agencies' credit downgrade, by pushing rates down to zero and keeping them there until everyone very clearly understood that the rate was going nowhere north of that level. No...better yet...if the Fed were really smart (like, if it were run by me!) I'd wait until all the lemming fools shorted Treasuries on a credit downgrade, then I'd bury them all once and for all by pushing rates down to zero. Get rid of all the cockroaches at once!! Here's another sampling of Schiff's idiocy. Schiff is also completely missing what is going on in Europe with the Eurozone and how THOSE countries are all seriously at risk to see skyrocketing interest rates, not the U.S. which is a currency issuer. He doesn't understand this. The U.S. public debt has gone from $900 billion in 1980 to $13 trillion currently and interest rates have fallen from 20% to 0%! Yet Schiff and most of the mainstream of economics still cannot see that there is absolutley no connection between the national "debt" and interest rates when a country spends in its own currency and where that currency is non-convertible. The interest rate is a parameter set by the central bank, period!! I'll be on "Countdown to the Closing Bell" with Liz Claman on 4/26 at 3pm-4pm on Fox Business! I'll be the featured guest for the entire hour on "Countdown to the Closing Bell" with Liz Claman on the Fox Business Network, Monday, April 26 (my birthday!) at 3pm - 4pm. We will be discussing a lot of the topics I talk about here: debt, deficits, the Fed, monetary policy, the euro's troubles and plenty more stuff. Hope to spread the word about Modern Money Theory. Please tune in if you can!! Greek falling further into the abyss. “The labour market will continue to deteriorate in the coming months, as a result of plunging demand, large spare capacity levels and an increasingly worrying economic outlook,” said Diego Iscaro at IHS Global Insight. Pressure mounting. Long consolidation in the euro at 1.35 will give way to much lower exchange rate. Read how you can make up to 20 times your money on a euro crash! Go here. Where's Meredith Whitney now? Got lucky on the way down...clueless on the way up!!! Just like Schiff!! This was a great article sent to me by Warren Mosler. It was written by NY Fed president, Beardsley Ruml back in 1946. He clearly understands the distinction between a sovereign currency issuing nation that's not on a gold standard and one that is. Too bad all of academic economics and current policy makers at the highest level DO NOT UNDERSTAND!! Very enlightening. Read the full article here and send it to your representatives in Congress!! Let it be known...Bill Gross, Larry Kudlow, Larry Summers, Tim Geithner, all of the financial media and every economist on Wall Street...DO NOT UNDERSTAND THIS BASIC CONCEPT!!! And things are not getting a bit crazy again??? Japanese clothier Uniqlo agreed to pay $300 million over 15 years for a location on 5th Avenue. That's $1.67 million per month!! Too bad...I'm long Japan. However, it seems they haven't learned anything. This is like the $3 million golf club memberships back in 1990! Forex markets set to explode! Don't waste time...learn to daytrade the currency markets now!! My upcoming 5-day intensive online forex daytrading course will teach you everything you need to know to be a successful currency trader! SEC accuses Goldman Sachs of fraud!! Loans surge $428 billion in the latest week! This could be the start of something big!! Don't let a bad economy force you to take a hit in income. Learn to daytrade the best markets in the world--Forex! This 5-day intensive training will teach you how to take consistent profits out the forex markets. Learn to use the extremely powerful Oanda forex platform. On over 40 different currency pairs, including the Chinese yuan! Go here for more info: Mike Norman's Intensive Forex Daytrading Course. The deficit for the first half of the year is $64 billion less than last year and full-year estimates have it as much as $300 bln lower. Since deficit spending adds to the net wealth of the private sector in the form of greater holdings of financial assets, this constitutes a drain of private sector wealth. It's one reason that I remain bearish on the stock market. Anyone who has been reading my report, "Fiscal Trend Digest" already knew of these trends months ago. Fiscal Trend Digest is the only daily in-depth analysis of fiscal trends anywhere! Subscribe to Fiscal Trend Digest here. Great. Now are they prepared to do that for Spain, Italy, Ireland and Portugal? Because that's what they'll need to do as each of those countries are struggling with similar--or worse--debt problems. (Reuters) - Greek banks, hit by a series of credit rating downgrades linked to the country's debt crisis, have asked the government for more financial support, Finance Minister George Papaconstantinou said on Wednesday. "The banks have asked to use the remaining funds of the support plan," he told reporters, referring to a package first agreed by the previous conservative government in 2008. About 17 billion euros ($22.72 billion), mainly in state guarantees, remain in the 28 billion euro support scheme, launched to help Greek lenders cope with the global credit crisis. The Central Bank of Greece said non-performing loans in the banking system rose further in the last quarter of 2009, bringing the full-year ratio to 7.7 percent. The banks' plea for extra help highlighted the problems facing the entire Greek economy, which is expected to contract by at least 2 percent this year, partly as a result of austerity measures imposed to slash a huge budget deficit. IMF officials began talks in Athens on Wednesday on implementing the austerity plan, just as the latest market jitters over Greece's ability to manage its debt mountain eased slightly, despite uncertainty over a euro zone rescue plan. The IMF proposed austerity plan will sink the Greek economy even further, putting more stress on bank assets. Banks failures will increase and that will precipitate bank runs. Greece and all of the other countries in the Eurozone have no credible deposit insurance. Bank runs could easily spread from Greece to the rest of the weaker periphery and, ultimately, to the big economies of Germany and France. The dominoes will soon start falling. Learn how you can make 20 times your money on the coming crash of the euro here. Euro hits the skids as Greece situation deteriorates! The euro is down sharply today on the heels of renewed stress in Euro bond markets. Find out how you can make 20 times your money on the coming crash in the euro. Better hurry, it's beginning to happen! Read here. This announcement poster below provides another reason why April 1st is called 'April Fools Day'. 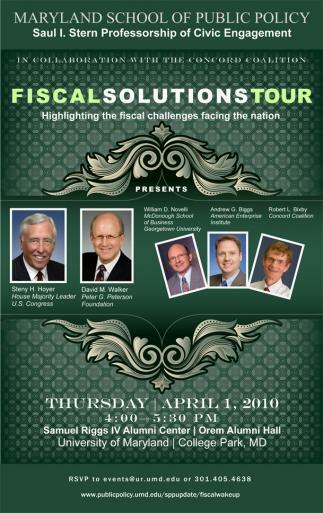 Think of all of the wasted time and financial resources that occurred at this event. 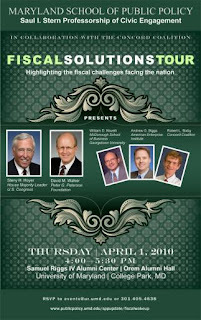 Discussions about "fiscal solutions" for the U.S. when nobody on the list of speakers evidences an understanding of Modern Monetary Theory; which leaves out the true "solutions" that are possible for our County that operates under a free floating, non-convertible currency system. A Country whose Treasury spending is never revenue constrained. This is an outrageous statement by the president. It displays total ignorance of our monetary system. But this view is widespread and it will result in policies that limit our economic growth and bring on the very hardships that come with real bankruptcy. What a shame.